Before I give another personal example of a coincidence lets just check on what the words coincidence and synchronicity generally mean. (Instance of) being coincident; notable concurrence of events or circumstances without apparent causal connection. 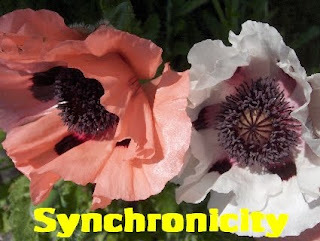 As for synchronicity, this is a word coined by Carl Gustav Jung. He used it to describe coincidences that are related by meaningfulness, rather than cause and effect. Without getting any deeper into the subject, and to keep things simple, here's my second personal experience. Actually it's a about two grandchildren my wife and I share. The coincidence is easy to explain. One of the grandchildren (both have the same mother and father) was born on my wife's mother's birthday and the other on my wife's father's birthday. When you think of all of the dates in a year when they could have been born, it's a big coincidence that the children were born on such related dates. At this stage I'm not trying to place any reasons for such coincidences but just recording them as examples. Later, perhaps, things will fall into place as to why such things occur. Our oldest son was born on the deathdate of my husband's grandfather-his mom's dad. Our youngest son was born on the deathdate of my husband's grandfather -his dad's dad! How strange is that! How strange is that - there seems to be 'something' that links us all together.